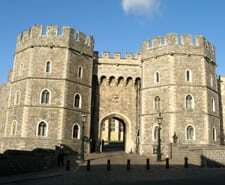 The College of St George occupies a large part of the Lower Ward of Windsor Castle. See The Lower Ward virtual tour fullscreen (link opens in a new window). This is the main entrance for congregation & visitors to St George’s Chapel and leads to the south Nave aisle. The Middle Ward of Windsor Castle consists of the Round Tower with its surrounding dry moat, walls and tower. Although much developed through the ages, it formed the central feature of the Norman defensive stronghold. Mary Tudor Tower, built in 1359, used to be the chapel belfry and is now the home of the Governor of the Military Knights of Windsor. It bears the arms of Queen Mary I and of her husband King Philip II of Spain. Adjacent to this tower are the homes of the Military Knights of Windsor, who represent the Garter Knights at services at St George’s Chapel. The main entrance to the castle used to be through King Henry VIII Gate, built in 1511. The carved panel above the arch displays the arms of King Henry VIII, together with the pomegranate of Queen Katherine of Aragon, his first wife. For visitors to the castle this gate is the exit. The photograph shows the gate as seen from outside the castle. 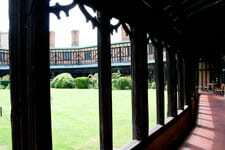 The Horseshoe Cloister was built between 1478-1481 by Kind Edward IV for the priest vicars serving the Chapel. They were restored and re-modelled by Sir George Gilbert Scott in 1871. They are now the homes of the Lay Clerks, the gentlemen of the choir. If you can’t see the tours, don’t worry, it’s simply a case of downloading the flash plugin with which to view them. Click here to download the flash plugin (opens in a new window). After you have clicked on the tour above, you can use keyboard shortcuts to navigate around the tour.